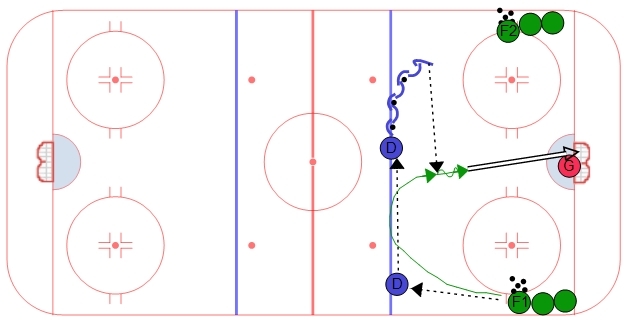 In this drill the defense will work on quick D to D passes at the blue line and then timing the third pass with the Forward (F3) in the high slot. The Foward starts the drill with a pass from the half wall to the strong side defense. The defense make a quick D to D pass to the middle of the ice. The defense who receives the pass in the middle of the ice needs to work to the outside of the dots to spread out the defense and create space for F3 in the high slot. Once the shot is taken from F3 they should follow their shot and then provide a screen for the next repetition. The defense will then slide over and do the same thing from the other side of the ice.